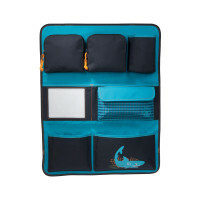 Product information "Car Wrap-to-Go Shark ocean"
description & equipment This practical car organizer, the Car-Wrao-To-Go, offers pure travel comfort. It can be easily attached to the backside of a car seat so that children have everything within easy reach while on the road. Whether it's a toy, plush animal, snacks or beverages, there's enough space for everything in one of the several zipper or Velcro compartments to keep everyone happy. 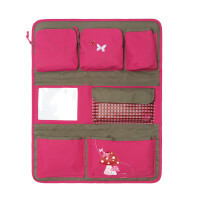 The stylish accessory therefore caters perfectly to the needs of children and assures a smooth and quiet trip for parents at the same time. Various designs are available.